Converse and noted sneaker retailer, Footpatrol, team up this season with two new iterations of the distinct Chuck Taylor and the unique Jack Purcell silhouettes. With panelled loopback cotton uppers, these shoes feature tonal midsole prints and translucent outsoles, tied together with a dual-branded, woven flag tag. 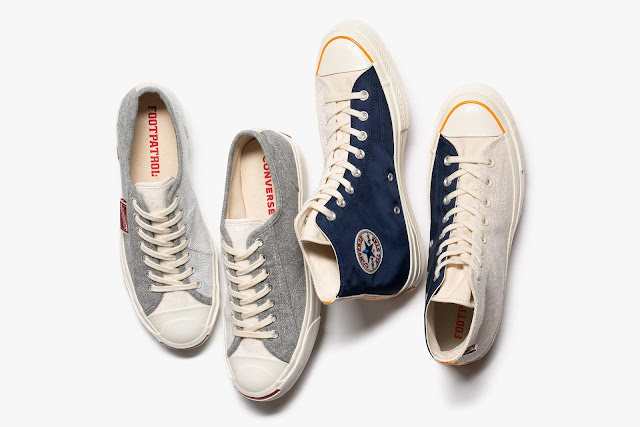 The upper of the Chuck Taylor silhouette features a split loopback cotton and nylon twill construction, while the Jack Purcell silhouette offers loopback cotton and a heathered wool construction.